2019 could be one of Apples toughest years. Mac sales have flattened and iPad sales are on a downward trend. However, the major blow comes as a result of weakening iPhone sales and agitated investors, leading Apple to comment that it will no longer report on iPhone unit sales. Perhaps the hype of Apple products has dwindled. This is no doubt due to increasing competition from Android manufacturers as they release competitive lineups of innovative products. For example, Android based phone manufactures have promised several upgrades in 2019, including a number of 5G-capable flagship phones that one can imagine will increase concerns about the iPhone’s future, especially where the iPhone is expected to be a latecomer into the 5G space. This is likely to cause more concern for investors. Although these worries are real, iPhone followers have proven to be quite resilient in their loyalty to Apple over the years. Millions the world over have inserted a prepaid SIM with some mobile data in it and now use their iPhone internet connection as the center to their lives. The reasons behind such loyalty can be debated; is it due to quality or is it more about prestige and social standing? 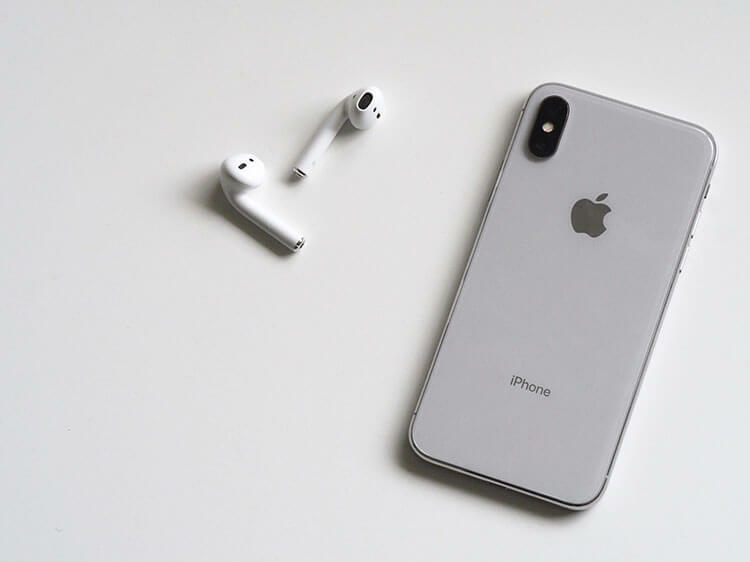 Debates over the reasons for iPhone loyalty will require an independent discussion, but the fact remains that such loyalty may not be enough for Apple to hold on to, or increase, its share in the smartphone market given the competitive Android-based lineups of 2019. Back in December, the President of the United States of America (U.S.), Donald Trump, stated that he could impose 10 percent tariffs on iPhones and MacBooks imported from China. In an interview with The Wall Street Journal, Trump said if the trade talks with China don’t resolve trade tensions, he might increase tariffs on the products imported from China to 25% from the current 10%. Additionally, he suggested that he may apply tariffs to imports such as laptops and mobile phones, which are currently not subject to import duties. Apple manufactures most of its products in China, and so news of Trump’s suggestions have caused concerns that the Apple Watch, iPods and other gadgets might be affected by tariffs on Chinese goods. If import taxes are imposed on the iPhone, its already expensive price tag could increase even more — a scenario that may finally cause loyal customers to look elsewhere, hurting the iPhone sales. In a proactive move, Apple is already planning to shift some of its production out of China. According to D.A. Davidson’s Tom Forte, Apple is in a strong position to mitigate tariff risks. The smartphone giant plans to add 5,000 jobs in Texas, as well as more jobs in San Diego, Seattle, and Culver City. This can serve as a solution to the potential tariff problem, in the event it becomes a reality. However, if the tariff war between the US and China continues throughout 2019, the chances of Apple getting caught in the crossfire will increase. Apple and Qualcomm, a chip-making giant, are engaged in a prolonged, legal battle over heightened licensing rates and patent fees. Apple sued Qualcomm in three countries, including a $1 billion lawsuit in the U.S. The dispute has involved regulatory bodies and courts around the world. Qualcomm recently won a lawsuit against Apple in China, as the latter was found to infringe on a Qualcomm patent related to smartphone power management. Further, Apple has been forced to pull down the offending devices, including the iPhones 7 and 8 in Germany. The company has also been ordered to recall its devices from third-party resellers. This particular development may prove especially daunting, as third-party companies may cause violations of the orders against Apple by continuing to make their inventory available through other channels. Given the prospect of a damaging battle between Apple and Qualcomm, or adverse judgments, investors are concerned and desire a swift resolution. Analyst Ming-Chi Ku, one of the top Apple watchers, doesn’t have good news for the company. 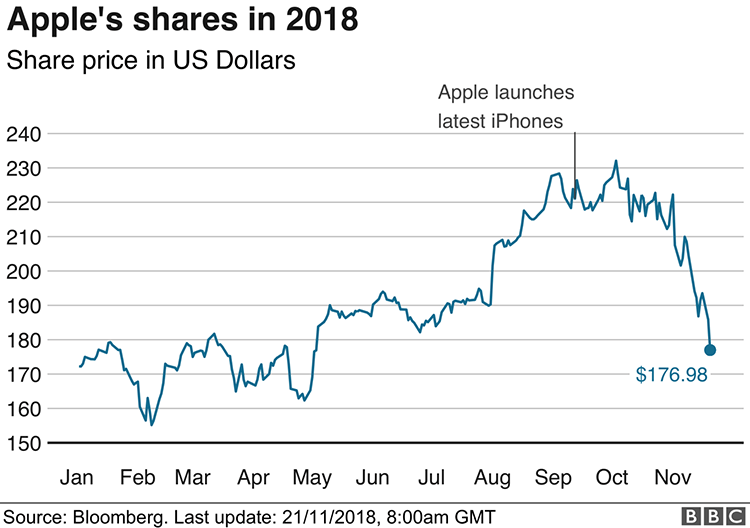 Kuo expects that, compared to the 210 million iPhones sold in 2018, Apple will sell 188 to 194 million in 2019, a 5 to 10 percent decline below investor expectations. HSBC (Hongkong and Shanghai Banking Corporation Limited) analyst, Erwan Rambourg, believes that Apple’s meaningful hardware growth is over. After Rambourg’s analysis, Apple shares fell 2.1 percent in premarket trading and, in the past three months alone, it has seen a 19 percent drop in valuation. However, Rambourg believes that if the company focuses on pure innovation in areas such as AR glasses, autonomous cars, etc., it can avoid a situation where its user base shrinks. Rumors suggest Apple is expected to launch the 5G iPhone in 2020. However, companies like Samsung, Huawei and Xiaomi have all promised to launch their 5G smartphones in 2019. Smartphone makers are using Qualcomm’s new Snapdragon 855 smartphone chip that can handle super-fast 5G connections. Being in a legal battle against Qualcomm, then, may prove to have a negative effect on Apple where 5G is concerned. Also, being a late mover into the 5G market may have further negative effects on Apple from a competitive standpoint. However, there is still some hope for Apple. Australia, for example, won’t get access to 5G until 2020, coinciding with the expected release year of the 5G-capable iPhone. Perhaps this move may give Apple and carriers ample time to perfect their 5G capabilities as they analyze the 2019 5G releases. Apple, true to its unique branding, is reportedly building its own rival 5G chip with Intel to avoid working with Qualcomm. Final Words – Can loyal iPhone users keep Apple relevant? Apple has built its brand on a differentiation strategy. The iPhone stands alone with a software unique to its hardware, placed in a market where other smartphones share one software — Android. This creates an attractive quality for iPhone users for several reasons, most important of which are the perception of quality in that uniqueness, and prestige in social standing. As the company’s customer base has so far been loyal in the face of increasing Android competitors, perhaps 2019’s advanced Android-based lineups might be the year where those loyalists jump ship. However, Apple has mastered the art of innovation, as well as consumers’ wants, making it hard to count the company out. Perhaps the 2020 release of a 5G iPhone may be a strategic step as the company watches the market for rushed mistakes made by other manufactures; or perhaps it is just a late move in an aging company that has lost its innovative edge. How the company fares in the long run is yet to be seen, but all signs point to 2019 being a year where its expertise will be more critical than usual to its future survival.